這版的PHP.INI 裡面465行 default_charser = "utf-8" 打錯摟.應該是 default_charset = "utf-8". 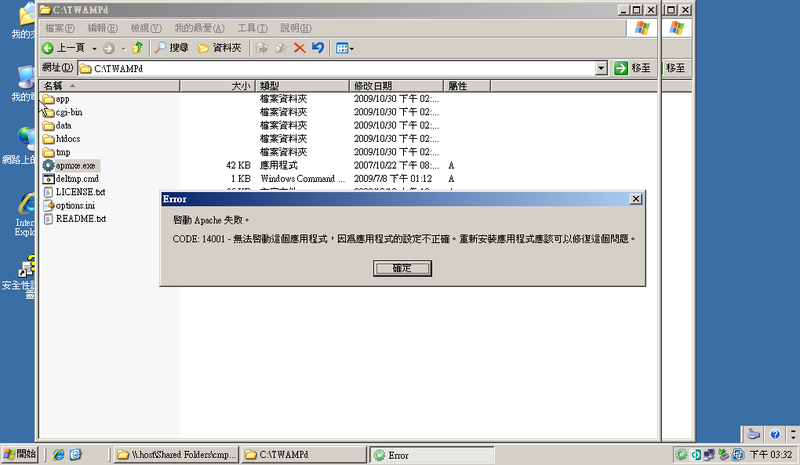 我是放TWAMP在USB(手指)用的, 我把 cck 放在htdocs\drupal-6.14\sites\all\modules 下, 但http://localhost/drupal-6.14/admin/build/modules/list 沒有顯示有關模組. htdocs\drupal-6.14\sites\all\theme 下放的 theme 亦沒有顯示. 是否我放錯了位置? 第一個問題已經解決, 開始時我用IE7安裝, 後來我關了TWAMP使用 firefox 重新安裝便沒有問題. 但仍然希望了解編輯完畢如何放回網上. 我考慮使用 Rackspace Cloud Servers (http://www.rackspacecloud.com/cloud_hosting_products/servers) 作學習用途. 是否裝TWAMP上Servers便可以用? 我是使用Servers新手, 以前是用share hosting 用 Servers 安TWAMP時有什麼需要注意?